There are many varieties of black rise from China, Korea and I think Thailand too. Someone asked me today what they should do with some black rice they purchased to make a salad. 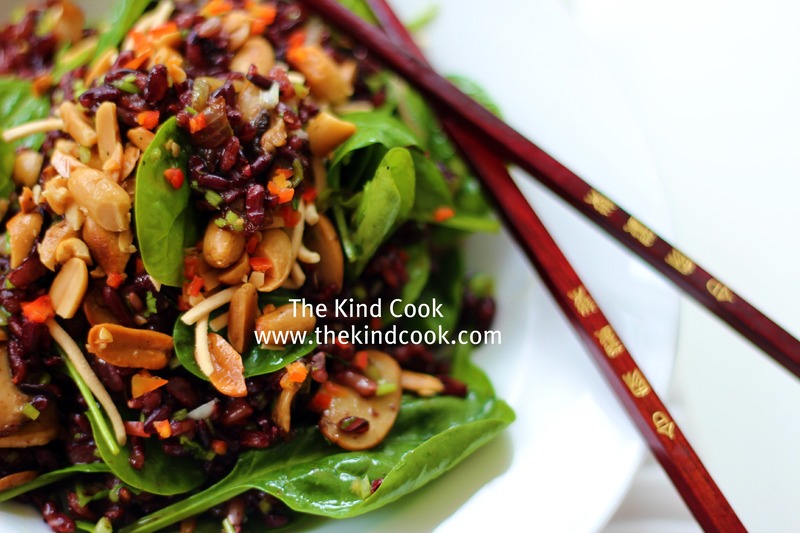 Having not done a black rice salad before I just made suggestions on flavours and ingredients I thought would compliment such a staple. Then I decided to see how it would turn out so I made one. The result was an aromatic, garden scented, dish with the black rice the platform for a range of fragrant Asian favourites. The nuts, noodles and coriander roots give it a gorgeous crunch. If you want an extra kick, simply leave in the chilli seeds and/or add more chilli. 1 small red chilli, cut in half lengthwise. Remove the seeds and finely slice. Rinse the rice under cold water. Put it in a pot of water, bring it to the boil and simmer until the rice is tender. Mine took about 30 – 40 minutes. I just pottered around and made the dressings etc while the rice cooked. I rinsed mine when it was cooked too in case there were any starches because I used the gelatinous one. Drain and set aside. Make the dressing. Place all the dressing ingredients in a bowl and whisk. Add the cooked rice and all the salad ingredient to the dressing and mix everything together. Give the rice a good stir when you go to serve it. Sprinkle with the finely sliced chilli. Finally top it with the noodles and nuts, just as you are about to serve, so that they remain super crunchy. Servings: 2 lunch size serves or serve as a side with other dishes. Time: 15 minutes preparation. 30-40 minutes of cooking time. Notes: Don’t be put off by a longer list of ingredients. It’s often the recipes with a lot of ingredients that are the easiest and require the least amount of skill. The result is worth it too!